There is not an undoubted answer regarding the meaning of the colors of the Italian flag . However the most valid hypothesis is the one made by V. Fiorini, the colors came from the colors of the uniforms of the civic militia of Milan. These were green and white (so people called them "remolazzitt" (small radish) and some red parts were added on 19 August 1796 when the Militia become the National Guard. In October of the same year the Lombard Legion was constituted, and it adopted an uniform of the same colors and in orders issued the day 9 October (art. IX), it was stated that "each Cohort will have its National tricolored Lombard standard, differentiated by number, and ornate with the emblems of Liberty". Napoleon himself described the colors : "... the national colors to adopt are the green, the white and the red" (On the message to the Direttorio of 11 October 1796 for the constitution of the Lombard Legion) These standards had the colors vertically displayed with the green at the hoist and they were the very first model of the Tricolore, but only as a military flag. The first true national flag that used the colors horizontally displayed is the Cispadana Republic flag. This flag was adopted on 7 January 1797 and had the red at the top, the white in the middle, charged with the coat of arms, and the green at the bottom. On 17 July 1797 the Cispadana and the Transpadana republics were united as the Cisalpine republic which, on 11 May 1798, officially adopted the Tricolore which is today Italian flag (the flag was already in use at least since January 1798). We can so say that the model of the Italian flag came from the French Tricolore, while its colors came from the uniforms, like those of many German States. In 1802 the Cisalpine republic was transformed into the Italian republic and on 20 August a new flag was adopted. The new design was of the kind of the Napoleonic military flags: on a red field a white lozenge over which a green rectangle. On March 1805 the republic changed to kingdom and a golden Napoleonic eagle was added on the green field of the flag. The Tricolore, charged with the Savoy shield in the center, became in 1848 the national flag of the Kingdom of Sardinia and, in 1861 of the Kingdom of Italy. The State flag and the war ensign included the Savoy crown over the shield. Finally, on 19 June 1946, the plain Tricolore became the flag of the Italian republic. With decree of 9 November 1947, In order to avoid confusion with the Mexican flag at sea, two different coat of arms were added to the civil and war ensigns. - Bonaparte himself advised or imposed the green colour as the Corsican colour. Later, he used green for his House. - Green was, before the Revolution, the base of the uniforms of the City militia in Milano. - Green was considered as the Italian colour. This appears in an official note, dated 1805, written for the creation of the Order of the Iron Crown. - Green might represent the idea that the vegetation growth is more profuse in Italy than in the Northern countries." (my own translation from French text). "Article 12 - The flag of the Republic is the tricolor Italian: green, white and red, a triband vertically in equal dimension." Recently the Italian Govern has codified the colours of our flag (circular of the sottosegretario Gianni Letta of 18 Sept. 2002 and circular of the segretario generale Antonio Catricalà of 17 Jan. 2003). These colours have been determined by a commission of the Poligrafico dello Stato that has made a average of the colours of the flags of the Quirinale (the palace of the President of the Republic), of the Senato (Senate), of the Camera dei Deputati (House of Deputies), of the Presidenza del Consiglio (Presidence of the Council = Govern) and of the Ministry of Defence. I don't know if they are specialist codes. I've only copied those codes published on the Corriere della Sera (the most important Italian newspaper) when it reported the news about the colours. In the text they say that those codes are "pantoni". The same news are reported in Spanish (but the source is probably the Corriere) at <es.news.yahoo.com>. According to this piece: "The Government codifies the color shades for the first time: bright meadow green, milk white and tomato red." These are not meant to be "new" colors but rather to strictly codify those traditionally perceived as correct. According to "Televideo" slight different Italian flag has been displayed in the previous days in front of Montecitorio: green and red were darker then ordinary ones and white was replaced by a yellowish. Intini (member of Parliament SDI) asked the government to refer about this unconventional flag. "Italian opposition in flap over flag - Italian opposition leaders have accused Prime Minister Silvio Berlusconi of tinkering with the national flag, after subtle changes in its colour were introduced. One accused him of a "chromatic coup d'etat". The row began when observers spotted that a new Italian flag flying outside Mr Berlusconi's Rome office was subtly different from its predecessors. The green, they claim, is deeper, the red has taken on ruby hues, and the white has turned to ivory. Last September the Italian Government set up a team to work out exactly what shades of the three colours should be used on Italian flags. Mr Berlusconi's office, it is thought, may be the first to demonstrate the results. But his political opponents are furious. "It's a veritable chromatic coup d'etat," said Green Party president Alfonso Pecoraro Scanio. The party is so angry it wants a national referendum to allow the public to choose the right shades. Passers-by did not share the sense of outrage. "I don't mind - it looks like my flag," said one man. "It's not ugly even if the red is a little darker." Mr Berlusconi's office accuses his opponents of using the issue to attack the prime minister. The left was carrying out an unjustified attack when it should be more concerned with national interests, said Mr Berlusconi's spokesman." "Italians in revolt at new flag (Thu Apr 24, 9:36 AM ET) - ROME (Reuters) - Few people took notice when the Italian government decided to define last year the exact colours of the "tricolore" -- the green, red and white national flag. But the "makeover" has sparked a revolt in the last couple of days since Prime Minister Silvio Berlusconi's office started flying the new banner, with a slightly deeper green, a new ruby red and an ivory white. "It's a veritable chromatic coup d'etat," said Alfonso Pecoraro Scanio, president of the Green Party, which has called for a national referendum to decide on the "true colours" of the flag whose history dates back to the 1700s. Opposition leaders say the new version with its "designer colours" is an attack on the traditional flag with its more brassy hues. But most Italians wandering by the prime minister's offices in the centre of Rome shrugged off the facelift. "It's not ugly even if the red is a little darker," one man said. "I don't mind, it looks like my flag." (ANSA) - Roma, 29 APR (translated by me) - There could be a parliamentary motion to stop the quarrel abut the colours of the Italian flag. Some members of parliament belonging both to the Olive-Tree (L'Ulivo) and to the House of the Liberties (CdL) coalizations will ask the goverment to re-examine urgently the chromatic codes established in the circular letter which actually changed the national banner. The government replied that it was a "technical error": the Pantone codes do not correspond to the darker shades of the flags recently shown and so they should be considered erroneous. See <www.corriere.it>. So, the colours of the Italian Flag will return the usual ones. I was perusing info about Italy and came across a PDF for the Italian Ministry of Agriculture and Forestry. Above there are only the Pantone Textile (PTC) colors whereas this PDF included printing and web colors (PMS inks, CMYK, RGB, RGB Hex [web safe RGB], RAL and 3M). All info was found on pp. 6 and 18. For Italy, PMS 356 green, 1797 red. The vertical flag is simply the horizontal version turned 90 degrees clockwise. Article 12 - The flag of the Republic is the Italian tricolor: green, white and red, in three vertical bands, equal in dimension(s). There is apparently nothing in Decree No. 1305 of 9 November 1947 (confirming a Decree of the Provisional Government of 18 June 1946) which precludes the Italian tricolour from being hung vertically. However, Italy does not have a gonfalon. In Italy the national flag is rarely used too, but not for "sacredness" of it. 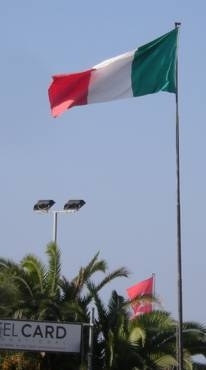 We Italian are not much patriotic, consequently we do not use the flag or its colors in everyday's life. The only occasions you can see the green-white-red flag appended outside the not-official buildings are the victories of Italian soccer team! ROME (Reuters) - Italian firebrand Umberto Bossi, the leader of the anti-foreigner, anti-European Northern League party, has been handed a 16-month suspended sentence for referring to the Italian flag as toilet paper. A judge in the northern province of Como convicted the 59-year-old politician of contempt on Tuesday and sentenced him to 16 months in prison but also suspended the term, meaning Bossi will not have to go to jail. Bossi's lawyer Matteo Brigandi confirmed the sentence to Reuters on Wednesday and said Bossi would appeal. At a rally in 1997, Bossi told a woman who was waving the national green, white and red "tricolore" to "put the flag in the toilet," and went on to say: "I've ordered a truckload of tricolore toilet paper to put in the toilet. There's a magistrate who says I can't have it. Come off it!" Bossi, who once wanted to create a separate nation in the north of Italy and call it Padania, is a partner in Italy's incoming center-right government. Now an advocate of devolution, he is on the cards to be made a deputy leader in incoming prime minister Silvio Berlusconi's government and at least two other Northern League members could also be made ministers. Umberto Bossi, leader of the Italian political party Lega Nord was sentenced by a court of law for implying that the Italian flag could be used when going to the toilet. The parliament has however revoked this (obviously because of Bossi's parliamentary imunity). Thus, Italian members of parliament can desecrate the country's flag, but ordinary Italians may not. Source: Swedish newspaper Svenska Dagbladet on 22 December 2001. (AGI) - Rome, Italy Jan 15 - "The public defamation of a flag as a simple, minor offence? I don't think so..." says Mirko Tremaglia in regards to the possibility of reclassifying this crime as proposed by the Nordio commission to reform the Penal Code. He calls for its withdrawal. The Minister for Italians throughout the world said, "I reject the proposal because the flag is the symbol of the Country. Its defamation or destruction, precisely because it is the symbol of the Country that represents our history, our soldiers, our lives, cannot be considered a minor offence and must be punished as established in the Penal Code." According to this member of the National Alliance (AN) party, "giving in to this is not compatible with the sentiments, the ideals and the values with which, in particular, Italians throughout the world are united." Tremaglia says that he wishes to also strongly reject the attempt to remove the crime of defamation of the Nation of Italy and of the decisions made by the Head of State. Tremaglia added, "How can this occur at the time when Italian politics are being celebrated and the President of the Republic cites the Tricolor flag as an instructional tool to educate new generations, and at a time in which reforms are being called for in order to reaffirm the prestige and representation of the Head of State." During a vacation in Rimini I noticed a flag with unusual proportions (1:2 or similar) as seen in this the photo. I think it can be a wrong made specimen, I don't know how many flags with this proportions exist in Italy (I've almost always found 2:3 flags). "On January 7 each year, the Italian flag, which was raised in Reggio Emilia over 200 years ago, is celebrated as a symbol of unity and freedom in our country. It is the flag of the "5 days" of Milan, of Garibaldi's mission and wars for independence; the flag of the soldiers who died in the two World Wars, of all the Italian citizens who must defend Italy's honour, unity and freedom". That was said by the President of the Republic, Carlo Azeglio Ciampi, on the occasion of the Festival of the Italian Flag. "With its colours, Italy greeted fifty years ago the return of Trieste within our boundaries and paid a tribute to the dead of Nassiryia. The mayors and teachers of all Italian municipalities, on the occasion of the various local and national holidays, often entrust that flag to the children of our new generations: together with the flag, they entrust them our history and our hope. Italy is an ancient civilization with democratic values on which both our institutions and those of a Europe which managed to overcome the divisions of their different peoples are based. Italy can look back with pride and ahead with serenity".